Asenath Hatch was born in Vermont and began teaching at 16. By age 31 (1823) she managed a boarding school in Elizabethtown, NY where she met Norman Nicholson (1785-1839) a widower with three children, who she later married. They did not have any children. In 1829 they moved to New York City where at first Norman was a merchant and Asenath a teacher, until she heard Sylvester Graham (1795-1851) speak and they then opened a boarding house based on Graham's vegetarian principles in 1833. "Table boarders" who lodged elsewhere but wanted the new vegetarian diet, were encouraged to talk on any subject, and many were active in causes such as abolition, temperance and some were religious leaders. The Nicholsons (then just Asenath when Norman left by 1835, died 1839) moved frequently, often every year. 1833 Cedar St., 1834 Wall St and Broadway; 1835 William St; 1838 Beekman St. until 1841 or 42. Then she was listed as lodging at two other locations until she set sail for Ireland in 1844. One tea-cup of coarse wheaten meal, one of sour milk or buttermilk, three fourths of a tea-cup of sugar, half a tea-spoonful of pearlash; made hard, rolled thin, and well baked. 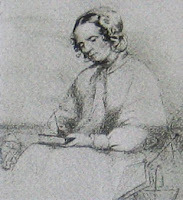 Nicholson traveled as a poor American staying with colleagues of her reformer friends and with the poor, keeping a diary from which she wrote about her experiences in two books. Going to Ireland for the first 15 months was to “investigate the condition of the Irish poor.” She returned to provide relief during the Irish potato famine, she operated a Dublin soup kitchen, gave out bread in the streets, and went to other parts of the distressed country. *Ireland’s Welcome to the Stranger … 1844, 1845 NY: 1847 (abridged edition 1926 Bible in Ireland).